To edit client metadata, select the Overview tab of the OAuth Clients page, and then select [Edit] in the upper right corner. Select [Update] to save your changes. You have the option to edit existing permission descriptions, or to change permissions entirely (add or remove). Select the Permissions tab on the OAuth Clients page. 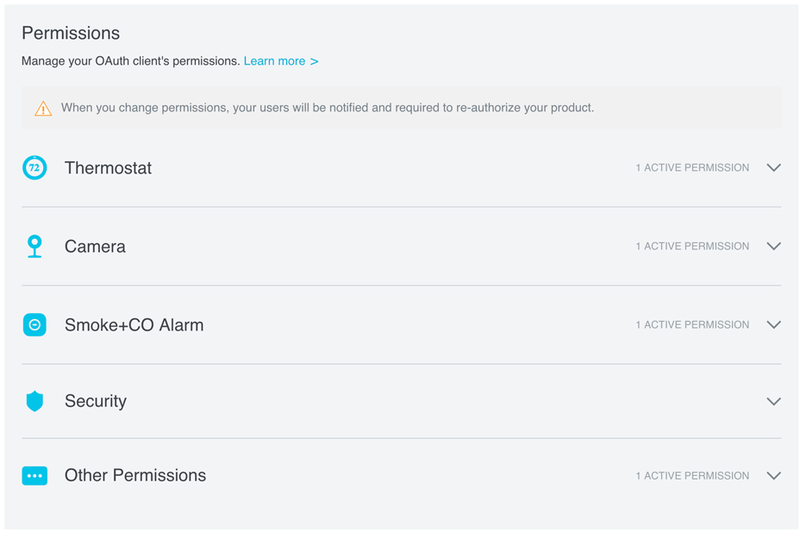 Permissions are grouped into five product categories: Thermostat, Camera, Smoke+CO Alarm, Security, Other Permissions. The number of currently active permissions within each category is displayed. Open the product category containing the permission you wish to edit. Select [Edit] for the target permission. Edit the permission description(s). If multiple locales are active for the product, the description for each locale is also available for editing. Warning: Editing the permission description for a permission that wasn't previously selected results in it being selected for your client. Only edit descriptions for permissions you need in your client. Select [Done] to close the permission description window. Note that this does not save your changes. 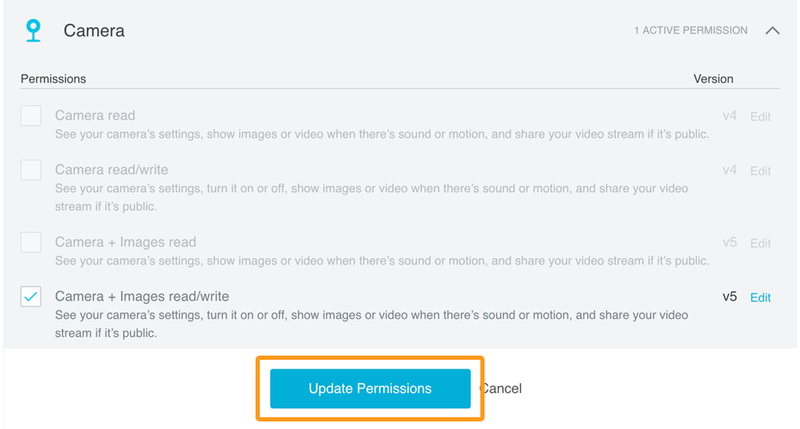 Continue editing other permissions, or select [Update Permissions] at the bottom of the page to save your changes. Select the Permissions tab on the OAuth Clients page. Open the product category for the permission you wish to add. Select the target permission from the list. Selecting a tiered permission will disable others in the same tier. 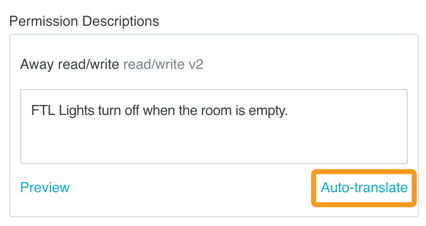 For example, selecting the "Thermostat read" permission disables the "Thermostat read/write" permission—you cannot have both permissions active at the same time. Update the permission description for your selected permission and select [Done]. Note that this does not save your changes. Select [Update Permissions] at the bottom of the page to save your changes. Open the product category for the permission you wish to remove. Deselect the target permission from the list. Select [OK] to confirm the removal. Note that this does not save your changes. Note: When you add or remove a permission, your users will be notified and prompted to accept the new permission. For more information, see Manage Client Version. Your product must be supported by at least one platform app to be visible in the Works with Nest Store. Supported platforms are displayed on the product's individual Store page for customer reference. All other information is used in our product review process. Add all platforms that your product supports. The Minimum Supported Version is required for iOS and Android, as are the App Store ID for iOS and the Google Play package name for Android. All fields are required for Web and Other. We use locales to display localized product information in the Works with Nest page in the Nest app or on the web at home.nest.com. Localization is highly recommended if you plan to market your product in other countries. International customers are more likely to engage with a company and their products when content is localized and respectful of their language and culture. When you create a client, the US English (en_US) locale is added automatically. If you plan to localize your product and related apps beyond that, make sure to add those additional locales here, so that there's a consistent user experience between your product and Nest. Decide which locales you want to support as early in the design process as possible. Separate functionality from content that must be localized. Design your app with a neutral tone that doesn't focus on a specific culture or language. Allow your user interface to adjust to different lengths of localized content (for example, English is typically more concise than German). Avoid unnecessary complexity in text or strings. Ensure that values such as dates or numbers can be handled appropriately for other locales. Add a Nest app locale for each localization you want available in the Store. Then add localized product information. When you create a client, the US English (en_US) locale is added automatically. When you edit your client and add multiple locales, en-US becomes the default locale, but you have the option to specify a different default locale. 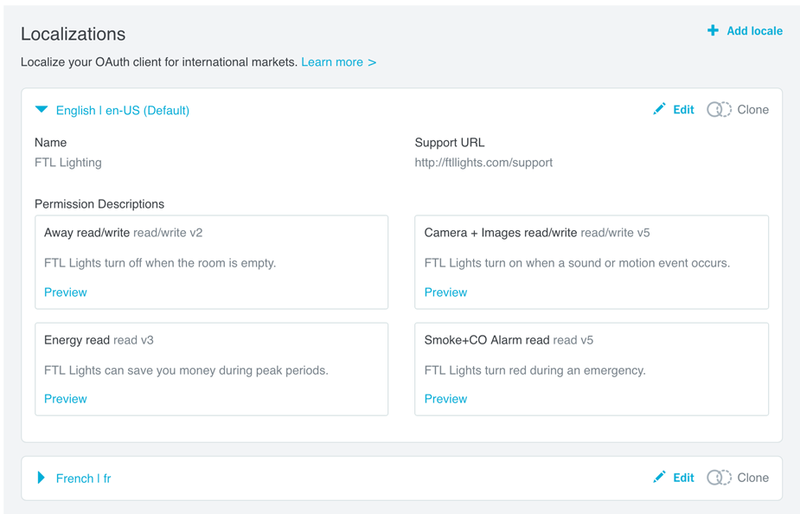 The default locale defines the product information your users will see in the Works with Nest page in the Nest app or on the web at home.nest.com. Note: If the user's operating system language does not match any of your available locales, the Nest app will display content in the default locale. When you choose a non-English locale, you get the option to auto-translate the permission descriptions during creation or editing of the locale. Caution: Use auto-translate only as a guide for localization. When you rely solely on auto-translate, you get a literal translation of the words, and you risk losing the meaning and context. Although we provide auto-translate, we strongly recommend using high-quality translations. Remember that the final text is shown to consumers and will drive their impressions of your product and its integration. Be sure to verify any auto-translated copy (with translators, local sources, or internal teams) before you use it in your product. Note: The Auto-translate option is not available for the default locale. Note: Auto-translate is not available for English-based languages, or for default locales.